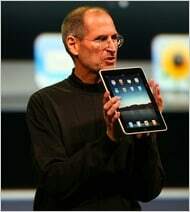 Home » Apple » Is the iPad Really the Next, Best Thing? Here’s Our Review! It has been months in the making, and has made for long conversations held by water coolers. Just what is Apple up to? What is their next biggest project that’s just on the cusp? And this week, we all got our answer. As Apple launched the new Apple iPad, it’s already being greeted with mixed reviews. And it’s not even available for sale just yet! Whether you think that Apple has once again landed on an undiscovered niche in the marketplace, or you think this is the silliest thing you ever could have imagined, here’s a breakdown on the Apple iPad, and what it can really do. When you first see the iPad, you might think you’re looking at a giant iPod Touch. While this makes some feel comfortable with an all-ready familiar design, others argue that it’s unoriginal on Apple’s part and that the whole thing looks a little ridiculous. There are app icons displayed on the Home screen, and a single Home button located at the bottom, just like on the Apple iPod Touch. So why do you need something that definitely needs a lap to sit in rather than the palm of your hand? Apple may not have expanded on the design elements on that much, but the ingenious that’s inside certainly is so much more. The e-book reader is one of the main features that’s boasted about the Apple iPad. While some immediately start comparing it to the Kindle, the iPad is so much more! It has a much better response time than the Kindle, and has its own built-in illumination, so there’s no need for extra accessories. Some debate that the iPad also looks much better than the Kindle, but that’s highly debatable. In a day when e-books are outselling books that are published in print, these fancy new devices are becoming one of the hottest trends ever. However, unlike the Kindle, the Apple iPad won’t offer discounts on bestselling titles on certain websites. But the iPad tablet does much more than just allow you to read books. You can also check out all your favorite videos, browse the Web, and enjoy all the different paint programs and other apps that will be available for the iPad. Checking out those different paid and free iPad apps may be difficult just yet. There aren’t any available that are strictly for the iPad just yet. So, it’s a lot like an iPod Touch but so much more. Is it like an iPhone too? Well, yes and no. The iPad does not work like a cellular phone. And thankfully, too. Can you imagine how ridiculous you’d look walking around holding this thing up to your ear? But, because it does have capabilities such as online satellite programs such as Skype, talking to anyone at anytime, face to face, is still completely possible with the iPad. And, with the iPad you also get a subscription service to AT&T that costs $15/month, strictly for Internet service. So, does the iPad have any downsides? Well, it is quite larger, being the same size as a small netbook and weighing 1.5 pounds. And even though Apple boasts things such as “10 hour battery life”, it’s still not specified as to what functions have been running during that time. Skyping, for instance, would take much more battery than reading an e-book. And while the design may be attractive to some, for others it may take some getting used to. Not to mention, that this gadget costs $400 for the basic model and twice that for the deluxe version. Why wouldn’t you buy a laptop for that price? Hard to say. The Apple iPad, ipad 2, and next apple ipad 3 could very well be the next best thing. But it might not be either. The iPod Touch received lots of criticism as well before it first broke out onto the scene. And let’s keep in mind that none of these things are even available yet so it’s difficult for anyone to say just by looking at it. But the fact that there are no apps or even prototypes available for review just yet, is one reason why it’s a little early to start getting excited about it.